Virtually every household in the First World uses light bulbs. Unfortunately, light bulbs don’t last forever. 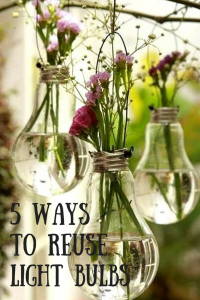 Instead of throwing away burnt-out incandescent bulbs, reuse them in a variety of arts and crafts projects. These crafts have not been tried with LED lights and are not safe with mercury-filled CFLs, however. Take CFL bulbs to a recycling or hazardous waste facility. 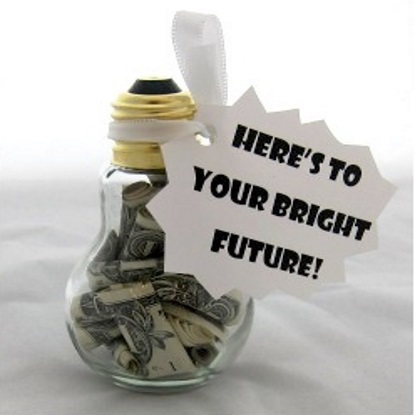 Since any mistakes can result in broken glass, these aren’t appropriate projects for children. Take extra precautions by wearing safety gloves and goggles. You’ll need a box knife, pliers, a nail or a flathead screwdriver, a pinch or two of salt and a few tablespoons of water. Use a box knife to begin to pop off the edge of the brass disk on the bottom of the bulb and then finish the job with pliers. Pull off the black glass cone that was attached to the brass disk using the pliers. Use a nail or screwdriver as a chisel if necessary. Use these tools to break the glass that holds the filament. Then throw out the filament since it won’t be needed in any of these crafts. Swirl salt water inside the bulb to clean it out. Keep swirling until the glass is clear. You’ll also want to keep the bottom screw part of the bulb for many of these crafts. 1. 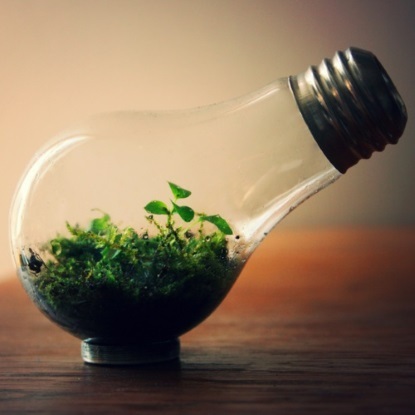 Mini garden or terrarium: Fill the bulb with a little bit of soil and pot some tiny plants inside. This project looks good resting on a flat surface, but you can also dangle the gardens from the ceiling with string or fishing line. 3. 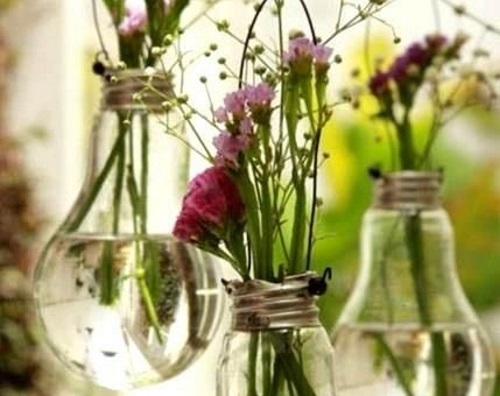 Hanging vase: Light bulbs can make cute tiny vases for plants as well. 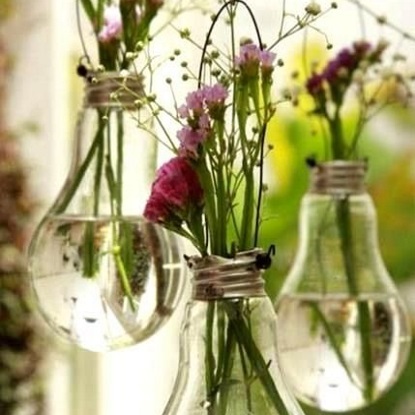 Fill the bulb with water and place a plant inside. Then hang the vase with string or fishing line. 4. 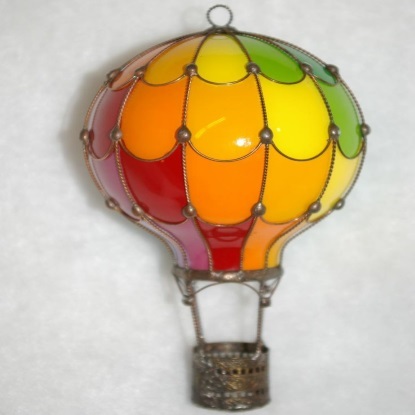 Glass hot-air balloon models: Paint the outside of a light bulb with bright colors so it looks like a small hot-air balloon. Repeat this step with several other bulbs to create a hanging mobile for a child’s bedroom. Simply paint multiple bulbs and hang them from the ceiling with fishing line so it looks like they’re floating in midair. Attach the fishing line with a dab of glue with a hot-glue gun. 5. 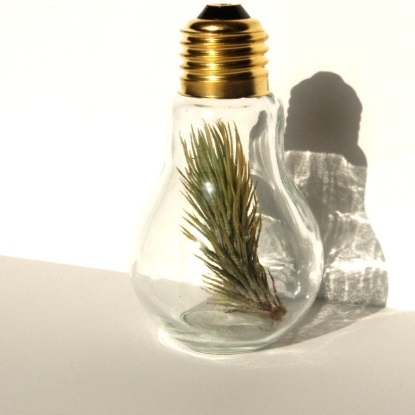 Air plant bulb: Place an air plant inside. Dangle the bulb with string or fishing line.